When it came time for my husband and me to pick our next vacation destination, I knew Nevis would be a perfect fit for us. With no kids to entertain and no interest in shopping, the tranquility, quiet and beauty of Nevis seemed very attractive for just reading, relaxing and enjoying great food. Flight choices to Nevis are limited, but even more so from our local airport in Providence, RI – there was only one option. We flew USAir to St. Kitts and then planned to take the ferry across to Nevis. Unfortunately, our flight was late, so we missed the regular ferry and ended up on the Auto Ferry. Just 2 passengers with suitcases and 10 vehicles. No problem! Thank God everyone has cell phones these days. Our local contact on St Kitts arranged for a car to pick us up at the airport and to get us to the ferry. Our cab driver in St Kitts called ahead to Nevis to tell Ian what ferry we were on. I was just glad to finally arrive after 7 hours of flying. What happened to the good ole days when a trip to the Caribbean was 4 1/2 hours non stop?! Villa HA LAM is just a short 5 minute drive from the Auto Ferry and we were soon at our honeymoon house! Yes, it felt like a second honeymoon! HA LAM is an adorable Nevisian/Swedish style wooden cottage with a beautiful lawn, sunsets from the verandah and the perfect size pool for two! The mountain/volcano is directly behind you so there are great views in both directions. 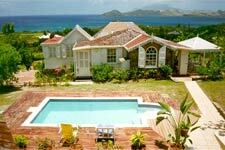 The villa is tastefully furnished and reflects the many world travels of the owner. The kitchen has patio doors that open up and with the verandah doors open in the front and the ceiling fans going, there is a lovely constant breeze. We never had the air conditioning on in this part of the house. There is every amenity in the villa including air conditioning, Internet access with the villa laptop as well as wireless reception throughout the property. There is cable TV and a vast collection of DVDs and CDs for your entertainment in both the main house and the cottage. Not only was the Villa HA LAM perfect, but the island was just what we were looking for. 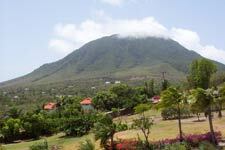 Nevis is a place where you can 'let your hair down.' The peace and the tranquility are absolute. We heard every bird and monkey and goat, but nothing else except the flute playing from somewhere near by. You can hear the rain, the wind and the bees; there is nothing to disturb you. For those that need that down time to rejuvenate, this is your island. My husband completed 5 novels to my 2. We mostly went out for a late lunch and dined in the villa. We moved according to our own rhythm - where else on earth can you do that?